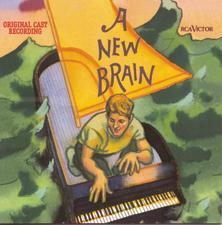 The product of two great theatrical creators, William Finn and James Lapine, A New Brain opened at the Mitzi E. Newhouse Theatre at Lincoln Center on June 18, 1998, under the direction of Graciela Daniele. The show stemmed from the real life experience of Finn, who was diagnosed with an inoperable brain tumor, but survived the ordeal and decided to write about it. By turns woeful and elated in tone, the musical was a joyful celebration of life as much as a cold assessment of its inevitable end. As Andre Bishop, director of the Center, wrote in his notes to this album, “The hero of the piece regrets things about his life […] and will miss those close to him should he die, but his biggest fear is that he may not live to complete his work, to honor his talent, to write all the songs that are in his heart.” Magnificently serviced by a stellar cast in which Kristin Chenoweth and Chip Zien held major roles, A New Brain closed on August 23, 1998, after playing 40 previews and 78 performances.